Tender, crisp, white and gold kernels have an excellent sweet flavor with the aftertaste of crème brûlèe! This unique synergistic bicolor is like any other corn we offer, standing out in the garden with its attractive red and green husks and leaves and bright-pink silks. 75 DAYS. Spacing10 - 12 inches between plants; 30 - 36 inches between rows. 5 inches apart, rows 24 inches apart. After seedlings come up, thin plants to 10 inches apart. FoliageRed & green striped husks and foliage. Soil RequirementsDeep, rich, well-drained loam soil. 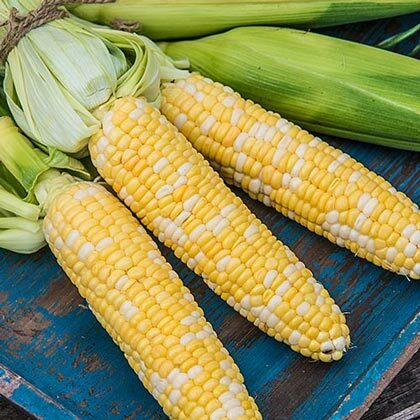 Seed CountA packet of 250 sweet corn seeds sows a 50 ft row. 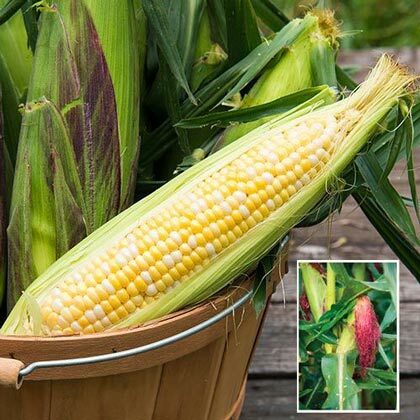 CommentsA standout in our staff trials, this unique, synergistic bicolor is unlike any other corn we offer. Attractive red and green striping in the husks and leaves with bright pink silks stand out in the garden. Tender, crisp, white and gold kernels have an excellent sweet flavor.